Browse this large collection of girls' sneakers and flats by Old Navy and bring home a versatile new style. Shop this inspired assortment of girls' flats and sneakers at Old Navy and find the perfect pair to match your child's unique style. Swapping out an old design for a new style from this line can breathe life back into her favourite combinations. Girls' ballet flats are great for a range of occasions from a summertime picnic with the family to a piano recital, a birthday party, or day in school. Sneakers from this collection match well with everything from blue jeans to shorts, or a playful skirt. She'll love wearing them on the playground, at the park, and around town with Mom or Dad. Girls' flat shoes from Old Navy are available in a variety of different colours and styles. Choose from ballet shoes, slip-on sneakers, traditional lace-up sneakers and more. From handsome blues and dark blacks, to leopard print and bright, vivid tones, she'll have no trouble selecting footwear that matches her best outfits. These popular creations will have her feeling amazing as she meets new friends, learns important lessons, and relaxes with the family. Get ahead of the next growth spurt and plan ahead for the coming season, or pick her up a pair to wear right away. She'll be all smiles in these cute sneakers for girls. 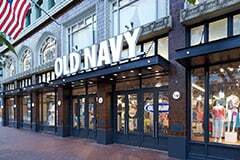 Shoes from Old Navy are made from choice materials. Easy to clean and durable, they'll last until she outgrows them. Brilliantly designed to fit comfortably, and reduce chafing or blistering, these wonderful accessories are a complete pleasure to wear, even after a long walk through the neighborhood. They are breathable and lightweight, and ideal for a warm summer day. Invest in high-quality garments and make sure she doesn't suffer an embarrassing wardrobe malfunction at the wrong moment. Set out on your family vacation and trust in her footwear. She'll enjoy seeing the sites or just laying low in these fantastic designs. Girls' cute flats and sneakers from Old Navy will make her old outfits sparkle like new.